This is the third in a series of three posts about hurdles to progress. The other two were on time, and then fear and doubt. Not in the mood? Pshaw!! The low oof!-thunk-clink-whew! sound could be heard from across the street. It didn’t even take a minute for the pattern to register, although I couldn’t identify where it was coming from. I scanned the front yard from behind my desk but I found myself getting up and walking toward the sound. Out the door. Look left, look right, look up (because, well, why not? ), look down, look all around, as the geocache mantra goes. Then I spied legs under a truck in the neighbor’s driveway and caught the quick movement of something flying in the air. Aha! Andrew was transferring bricks from a wheelbarrow into the bed of his truck. Actually, not little bricks, but the large retaining stone kind. Not unloading, but loading. Interesting! An idea came to mind, and I headed over to talk to him. 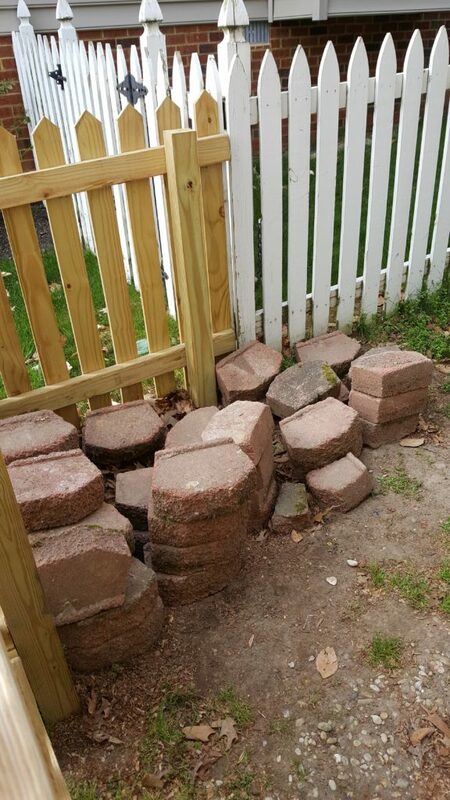 A few minutes later I was the proud owner of a truckload of retaining bricks and all the old patio bricks I wanted. Oh, lucky me! 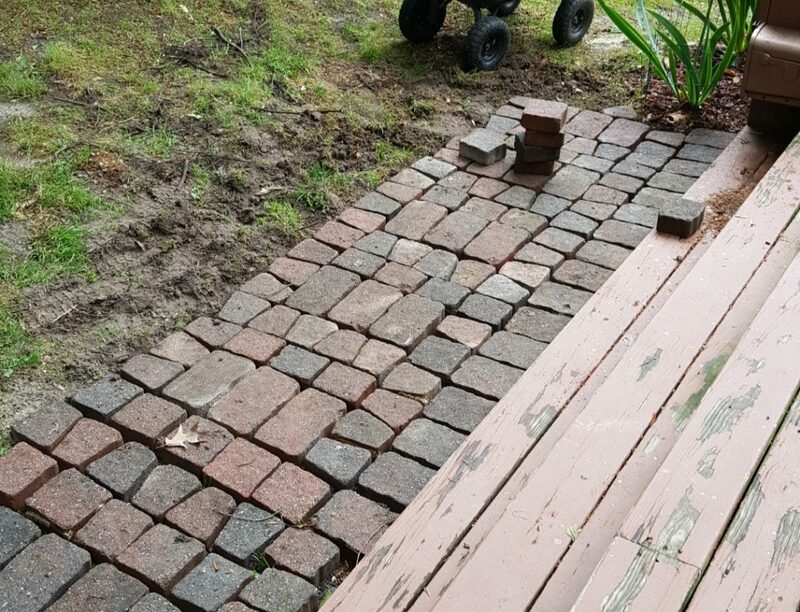 It didn’t take long for the excitement of this good find to wear down, though, as the deal included me getting the rest of the bricks from his back yard across the street and into my yard. My little wagon handles a payload of about six retaining bricks at a time. Guess how many trips that is? An hour later I was calling the guy who does my yard work sometimes to beg him to help. An hour after he got here, he called reinforcements, too. Never mind that I asked that the bricks be stacked by size; we were all tired and they ended up in piles that had to be sorted later so I could figure out just what I had bargained for. Three weeks later, I have given myself an education in bricklaying. 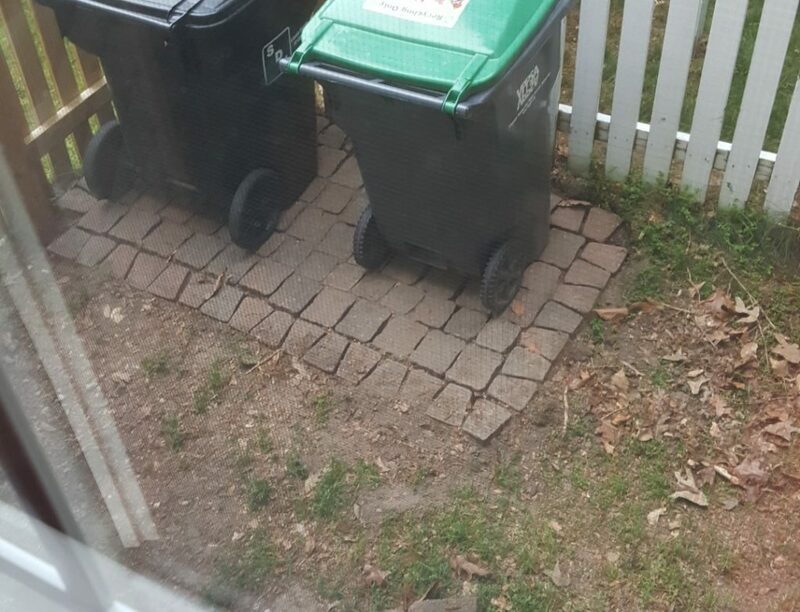 My accomplishments to date include a small pad on which placed a bench that kept sinking into the ground, a small pad for the trash can and recycling bin, and part of a pathway from the back of my house around the side to said garbage pad and garage door. Next up is a small fire pit slab. Inspiration came to me that first day. Although I had no plan in mind in that moment, for about two years now I have talked about putting in a sidewalk out back so I didn’t have to walk in the dirt/mud (depending on the rain or snow). As a matter of priority, though, I settled for “three squares and a bed” instead of hiring a landscaper or brick mason. 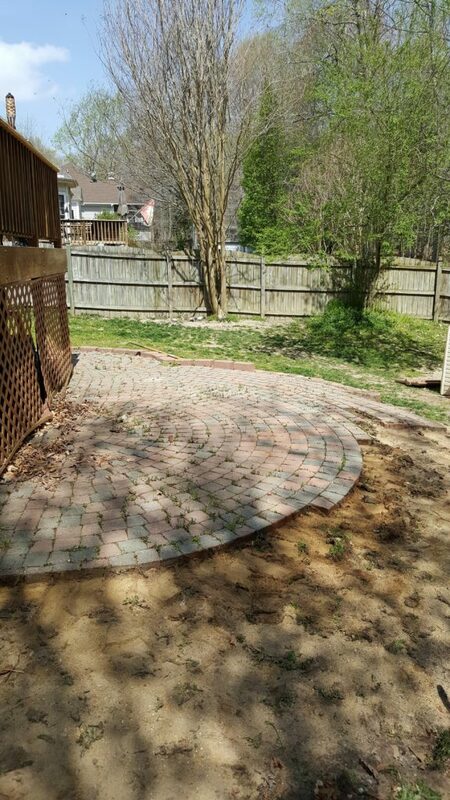 The last project I paid for was a tree ring out front, and that cost me $200, so I knew it would not be cheap to do all I wanted, even with the donation of the materials. The same goes for other necessary inspiration. Feeling inspired was not a luxury I could wait for and indulge in. If I wanted the bricks, I had to move them. If I didn’t want to stumble over them or look at the piles, I had to do something with them. If I couldn’t hire someone, I had to do it myself. That’s the thing about inspiration: the very act of doing something, the practicing of sorting and laying the bricks…well, I placed them rather than laid them, but anyway… fed ideas into me. I could have said I wasn’t in the mood, or I could have called on my old friend Procrastination, or just made up excuses for what looked like rubble to justify that this well had gone dry. But sorting them captured my interest. The next day I was playing with arrangements, trying out patterns. In a sense I was brainstorming on the ground. The first couple of attempts were laughable, and then I started scraping knuckles and breaking fingernails. So I went back to the old standby from the days at the office. I prompted myself with questions like “what if,” “what’s the worst that could happen,” and “what’s the best that could happen?” Soon I had so many ideas my test plots looked like a crazy quilt. The lines were crooked and I was obviously off track. I took a break and refocused. I revisited an earlier pattern, narrowed the options, and came up with one I liked well enough to start over. Yes, it was overwhelming from time to time. Just getting the mountain over here was trying. Then organizing and stacking in piles so I could tell what I had. Then finding a pattern that worked and was aesthetically right for my yard. And then the shear distance to be covered one brick at a time. So I came up with another plan. Every time I took the dogs out, which was 3-4 times a day, I would scrape, rake, and place another row of bricks. Soon it was not just a row but a block. When I got tired of the pathway,I narrowed the scope of what working on and shifted to create the trash cans pad. That was useful because I needed to see something done! This path was going to take days, if not weeks. I had to know that I could do it, and it would look plenty fine, and it would serve the purpose. 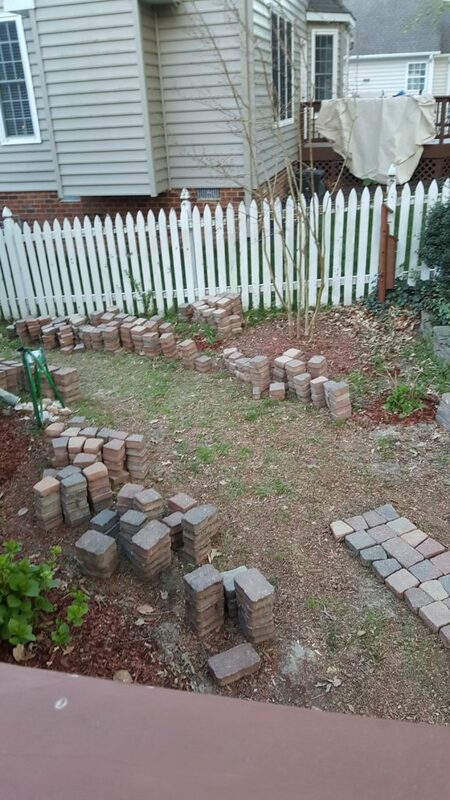 The piles of bricks didn’t seem to be shrinking, although I knew they were, but I had to see one project done. Mission accomplished. Spirit renewed! The pathway is about 2/3 done now. I’m up to an hour of brick work a day, and some days I make a lot of progress. Of course, the more I do it, the better I get. Now I can see where I have to go back to the early blocks and level things out, cut more tree roots, and close up a gap. Lack of inspiration is often blamed for lack of progress. My adventure with the bricks has reminded me that office tactics can work just as well in the backyard, and vice versa. First, start with something, anything; JUST GET STARTED! Then open up the mind to whatever shows up, letting ideas flow. Focusing, then refocusing, and maybe redefining the scope of the project. Prompting with “what if” questions. Testing out the ideas. Practicing. Recognizing overwhelmed feelings. Calling for help when it’s needed. And then fine-tuning along the way. Yes, it would be easy to say I just wasn’t inspired. I could have lost the opportunity, or I could have blamed the heat or rain or lack of knowledge. Instead, I cleared this hurdle, too. The reward this time is the sense of accomplishment, coupled with some nice improvements to the view (and the feet) out back. in Confidence, Performance, Personal Success.